Search teams say they have discovered part of a flight recorder from the Air France plane that crashed in 2009, off the coast of Brazil. But they say they have yet to find the section containing crucial data which could reveal the cause of the crash. The Air France Airbus plane went down in the Atlantic on 1 June 2009, killing all 228 people on board. The recorder section was recovered a day after a salvage ship began working to retrieve bodies. "During the first dive by the Remora 6000 which lasted more than 12 hours, the chassis of the flight data recorder was found, without the module protecting and containing the data," France's Bureau of Investigation and Analysis said in a statement. They said a second dive was under way. A spokeswoman for the bureau explained that though only the outer chassis of the flight recorder had been found, the flight data recorder itself, if recovered, could still be in a condition to be read. "The memory module is like a sarcophagus - the information is very well protected," she told Reuters. Investigators and Airbus stress that without the "black box" flight recorder, the mystery of the plane's last moments may never be solved. 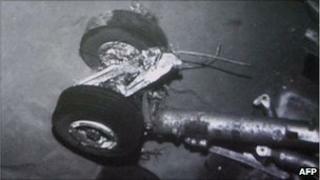 The wreckage of the flight was found on a fourth attempt, using robots capable of operating 4,000m (13,120ft) below the ocean's surface. Those who died on the Paris-bound Air France jet, which came down hours after it took off from Rio de Janeiro came from more than 30 countries, though most were French, Brazilian or German.